There are a wide variety of factors that can account for failure of embryo implantation and recurrent miscarriages for patients undergoing fertility treatments.These include the patient’s individual anatomy, genetic factors, hormone levels, blood chemistry, and immune system. It is thought that in most cases it is a combination of these causes that account for the problem, and that a single solution is unlikely to be entirely successful. Over the past decade, there has been a significant increase in research to identify possible immunologic causes for poor fertility outcomes. The embryo is formed of two cell lines (the inner cell mass and the trophectoderm). The inner cell mass contains the cells that form the baby and the trophectoderm contains the cells that will form the fetal part of the placenta. Implantation is a complex process that involves interaction between the trophectoderm and the womb lining (endometrium). During this process, there is mutual exchange of substances and chemicals. This is sometimes referred to as ‘embryo-maternal cross talking’. Successful implantation is the first crucial step in achieving a pregnancy. 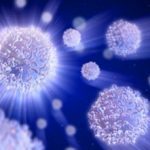 What do I need to know about Natural Killer cells (NK cells)? NK cells are immune cells that belong to a subcategory of white blood cells called ‘Lymphocytes’. They provide the body with protection against virally infected cells and potential cancerous cells. NK cells are produced by the bone marrow and then move to the blood circulation to play a role in the body’s natural defence mechanisms. Some NK cells will migrate to various organs including the gastrointestinal tract, liver and the uterus where they act as one of the immunological defence barriers in those tissues. In the uterine lining after ovulation and in early stages of pregnancy; NK cells account for more than 80% of the white blood cell population. NK cells produce and respond to a variety of chemical substances called ‘cytokines’. Is there strong evidence to support that abnormal NK cells are associated with poor fertility or pregnancy outcome? This matter is the subject of some controversy within the medical field. NK cells are the most abundant immune cells in the womb lining (endometrium) at the time of implantation. There are different types of NK cells. It has been suggested that an imbalance in the cytokines and the killing activity of the NK cells can have a negative impact on implantation and the progression of a healthy pregnancy. Results published in the medical literature have been contradictory. However, it is thought that recurrent miscarriages and recurrent implantation failures that can’t be explained by routine investigations might have an immunological cause. The HFEA, the Royal College of Obstetricians and Gynaecologists (RCOG), Science Advisory Committee and the American Society of Reproductive Medicine (ASRM) all agree that there is no strong evidence at the moment to justify immune testing and treatment in the context of fertility failure and recurrent miscarriages. “There is no convincing evidence that a woman’s immune system will fail to accept an embryo due to differences in their genetic code.” HFEA. Are the natural killer tests offered routinely at CRGH? NK tests are not routinely offered to all patients seeking fertility treatment as the majority of failed fertility treatments and miscarriages are secondary to a chromosomal abnormality in the embryo and not immune in origin. You will have the chance to discuss carrying out those tests with your doctor during the consultation if you have a history of recurrent miscarriages, recurrent implantation failures or if you have a personal history of autoimmune disorders (Such as lupus, rheumatoid arthritis, ulcerative colitis, auto-immune thyroid issues, Crohn’s disease….). What are the NK tests available at CRGH? NK cells can be checked in the peripheral blood or in the womb lining (endometrium). At CRGH we offer both tests. Endometrial NK cells are checked by doing minor operative procedure (lining scratch) that is done between days 15-25 of the period. The sample retrieved will be send to the laboratory for analysis. NK cell test is performed on specific days of the week, so please confirm with the clinic before booking the test. Natural killer cells in the blood are not a good reflection about the NK cells in the lining; however, there is evidence to suggest the association between NK cell activity in the blood and fertility issues. In most cases the blood test and the lining scratch are done on the same day. What are the treatment options that are offered at CRGH for elevated NK cells? Several immunosuppressive treatments have been used in this context. Three treatment options are currently available at CRGH.